On Feb. 2, Mount Hebron’s own Millionaire’s Club hosted its first-ever Club Induction Ceremony and welcomed over 50 Hebron students to the countywide stock market and personal finance organization. The Millionaire’s Club, sponsored by Technology Education teachers, Ms. Bernadette Bechta and Ms. Sandy Harrington, and lead by co-chairmen, seniors Hershal Chadda and Alec Vaughan, connects students with the resources to help them understand the inner workings of the stock market and the importance of a sound knowledge in personal finance. The club is also financially sponsored and represented by the Credit Union Foundation of Maryland. 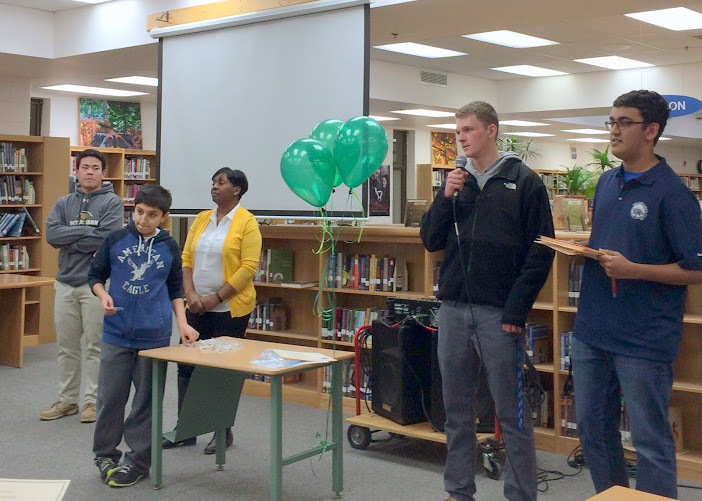 Vaughan (right) and Chaddha (far right) address the new inductees (Photo courtesy of Ms. Bechta). Coordinated by the Maryland Council on Economic Education along with Towson University, the Stock Market Game invites teams to test their investment skills and strategies in a virtual stock market environment. Mt. Hebron’s club, in particular, is divided into three individual teams which each consist of one trader, two assistant traders, and up to 15 researchers. Every member of the club is on a team and, based on his or her position, is assigned to either physically execute the transactions, define the sectors the team should invest in, or find specific individual investment opportunities within the established sector. While it is undoubtedly true that participation in the Millionaire’s Club requires hard work and genuine interest in the topics the club addresses, many report that the Millionaire’s Club is by far one of the most enjoyable extracurricular activities the school offers. Junior Carmen Bodziak stated, “It’s educational, but fun. It’s not a lot of pressure.” Bodziak also states that her favorite things about the club are “working with people towards a common goal and learning about stocks”. Guest speaker and Mt. Hebron alum Hoffman enlightens the members with his experiences in the professional world of finance (Photo courtesy of Ms. Bechta). 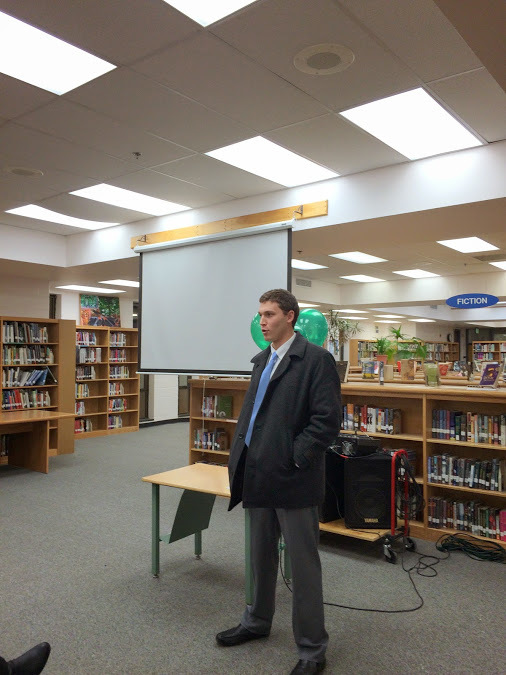 The induction ceremony took place right after school in the Media Center. Along with the presentation of congratulatory certificates and membership pins, inductees, as well as their family and friends, were treated to an inspiring keynote speech by Jesse Hoffman, a 2007 graduate of Mt. Hebron High School and a Salisbury University alumnus. Hoffman, a successful realtor and real estate investor, shared the story of how he was able to attain “millionaire status” by using personal finance techniques combined with knowledge of the real estate market. “It was inspirational [to see Hoffman speak] because what he did was something that we actually could do,” remarked junior Laura Radov. “I mean, he graduated from Hebron and attended Salisbury.” By several other accounts, students were inspired not only by Hoffman’s immense success, but also by how relatable his life story was to them. Inspiration just may be exactly what the club needs in the upcoming months. Recently, Mt. Hebron’s sector of the Millionaire’s Club has been selected to represent Maryland and compete in the Capitol Hill Challenge, a Washington D.C. based financial education competition in which teams from all 50 states try to make the most profit, measured against the changes in the S&P 500, while playing the Stock Market Game. It is clear to see that the Millionaire’s Club’s Induction Ceremony is only the beginning of the many great experiences the organization will be a part of in the future.